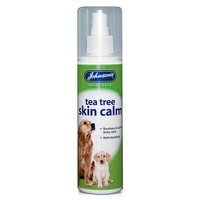 Johnson's Tea Tree Skin Calm has been specially developed for dogs, to soothe and calm skin irritations. The gentle formula consisting of Aloe Vera, Tea Tree and Lavender Oil provides relief as well as antibacterial protection, promoting the natural healing process. The gentle action of this spray makes administration easy.